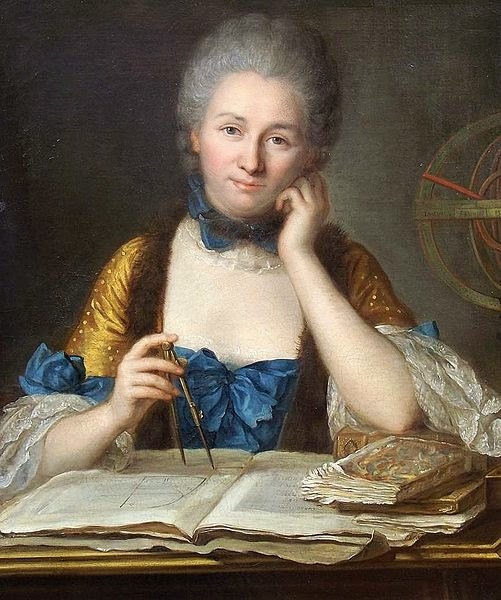 Rodama: a blog of 18th century & Revolutionary French trivia: Madame du Châtelet - portraits of a "femme savante"
Madame du Châtelet - portraits of a "femme savante"
What did Madame du Châtelet look like? The article on French Wikipedia conveniently gathers together a set of comments on her appearance and personality, all of them equally catty. According to the marquise du Deffand she was "large and dry-looking" with a ?florid complexion ("le teint échauffé"), thin face, pointed nose and small sea-green eyes. She remarks on her discoloured and damaged teeth. Emilie's figure also comes in for criticism: she is "without hips, narrow in the chest, with fat arms and legs and enormous feet". The Souvenirs attributed to Madame de Créquy likewise mentions the big hands and feet. The surviving portraits are more flattering, but to some extent confirm the descriptions. They clearly show the same woman, big boned, with a low forehead, long nose and small closed mouth (no doubt concealing those imperfect teeth)! Here are the main portraits, in so far as I have been able to find them on the internet. To judge from the features this portrait is undoubtedly a young Madame du Châtelet, with dark unpowdered hair. It is credited to either Bernard-François Lépicié (1698-1755) or his son Nicolas-Bernard (1735-84). Both ascriptions are slightly problematic - the father is known almost exclusively for engravings; the son, though a portrait painter, was surely too young to have painted this youthful looking Émilie. In 1892 the picture belonged to the Baroness Nathaniel de Rothschild. It is also reproduced in my old copy of Nancy Mitford's Voltaire in love from 1957 where the acknowledgement is "By courtesy of Mme. Thierry"; the engraving illustrated was for sale on ebay. As Elise Goodman points out the picture falls within a clear tradition of depictions of the "femme savante" who is both beautiful and learned. The book on display is Madame du Châtelet's own Institutions de physique, first published anonymously in 1740, then in revised form in 1742. It has to be said that Émilie tranforms a little awkwardly into a typical white glossy Nattier subject. This beautiful portrait by Marianne Loir was formerly in the royal collections and was acquired by the Municipality of Bordeaux in 1803 (Several copies exist, including Lot 3 of the 2012 sale) It is clearly the likeness of a real woman, though the pose is still that of the conventional "femme savante". 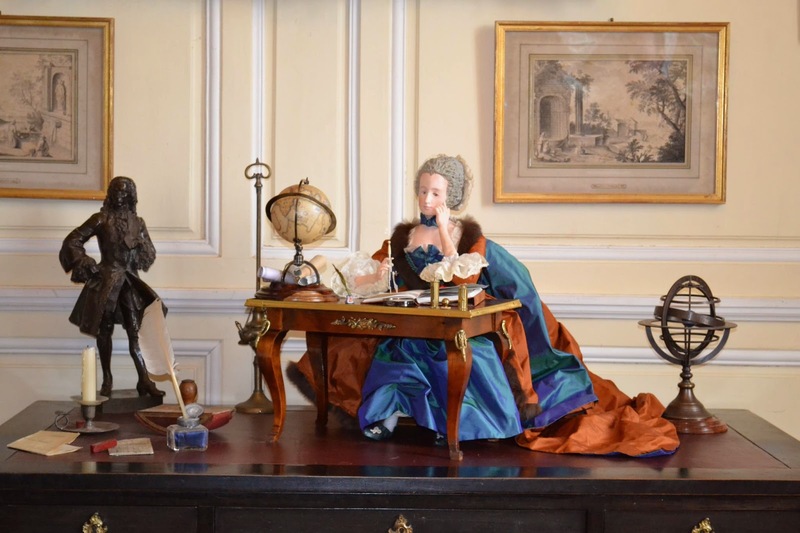 Émilie is surrounded by the paraphernalia of scientific scholarship, whilst the beautiful low cut gown in vibrant new Prussian blue and her white bosom emphasise her feminity. In her left hand she holds a set of compasses and in the right a carnation, symbol of love; perhaps the prominence of the flower was intended deliberately to affirm the dominance of the heart over the intellect. I am sure the Institut Voltaire knows what it is talking about. Nonetheless, this face does not resemble the known Nattier portrait, which seems altogether more characteristic of his work. This La Tour pastel is my favour picture of Émilie. There are several different versions; this one is from the Musée Antoine Lecuyer, Saint-Quentin. 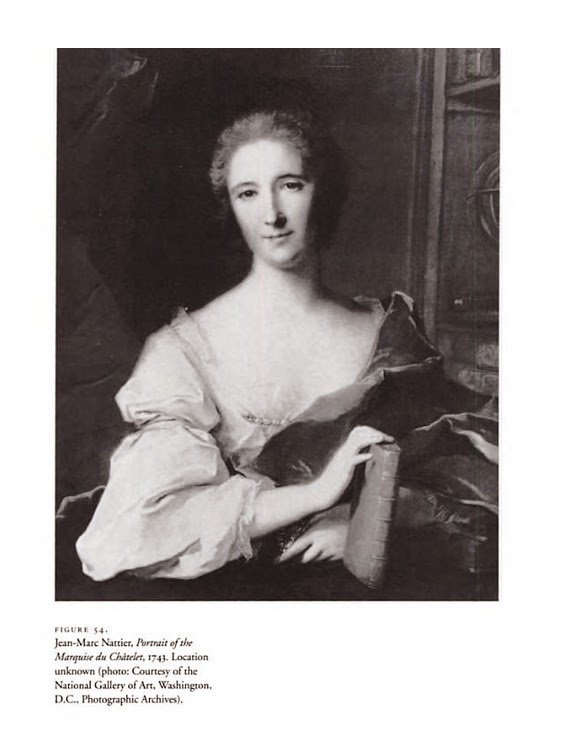 It is sometimes described as an "unknown woman" but Neil Jeffares in the Dictionary of pastellists identifies it as Madame du Châtelet, and he is obviously right! 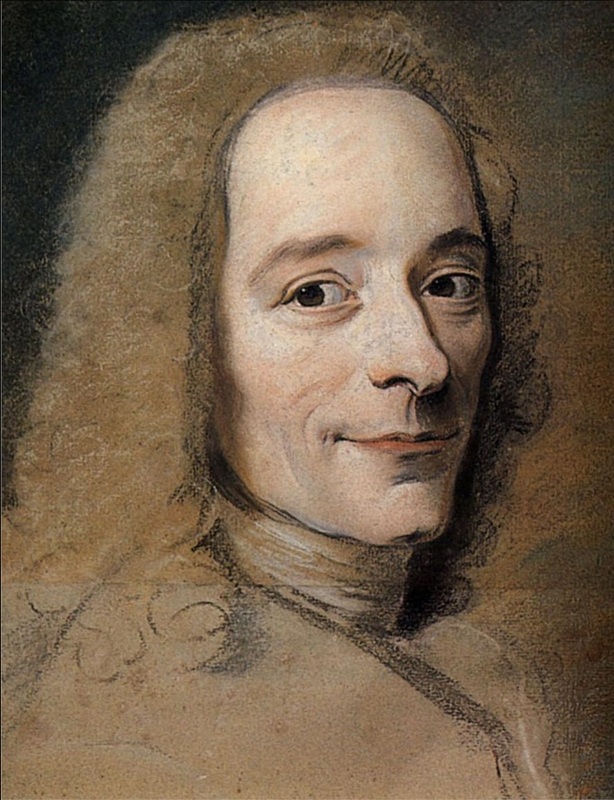 It compares with La Tour's studies of Voltaire which were done in 1735. It would be nice to think this is a close likeness of Émilie. Certainly it is unencumbered by any symbolic intent, though it is possible that the intelligent eyes and confident amused expression owe more to La Tour's interpretation than to Émilie herself. 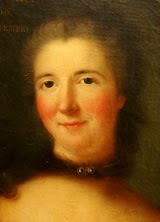 Since then the Largillière expert Dominique Brème has challenged the identification, concluding that the picture dates from about 1725 and represents a generic "docte Uranie". 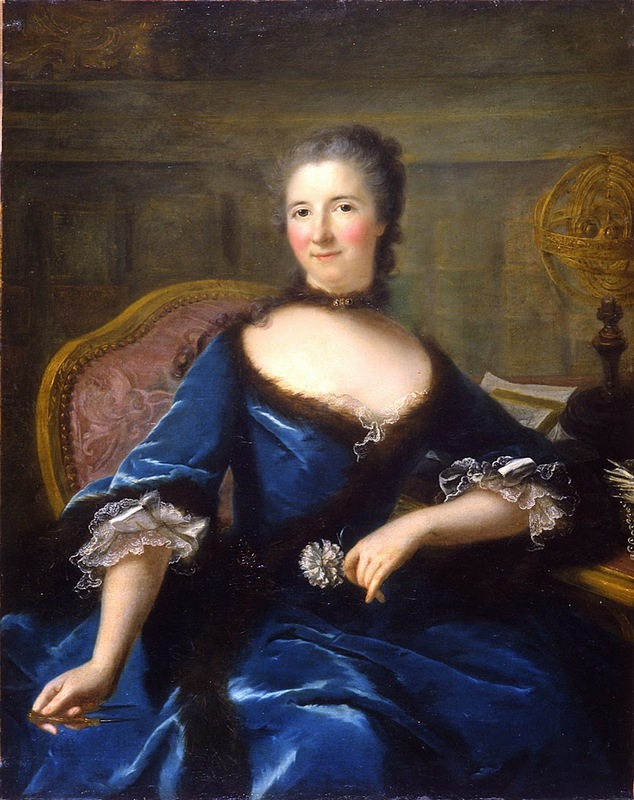 Madame du Châtelet's biographer Elisabeth Badinter agrees, as does the English expert Andrew Brown who took the picture down from the Madame du Châtelet French Wikipedia page!